When Chuck Jones, a senior vice president at Intuitive Surgical, saw The Wall Street Journal’s Management Top 250 rankings for 2018 in the newspaper last month, his first response was delight. After having been excluded the previous year from the Journal’s list of “the best-run U.S. companies,” the medical device maker had now landed at No. 206. That corporate executives are thinking along these lines is tremendously gratifying to those at the Drucker Institute, which created the statistical model on which the Journal bases the Management Top 250. The newspaper showcases the upper third of a larger universe of companies that the Drucker Institute evaluates annually for their overall effectiveness. “Effectiveness”—defined as “doing the right things well”—is assessed through the lens of five categories: customer satisfaction, employee engagement and development, innovation, social responsibility and financial strength. 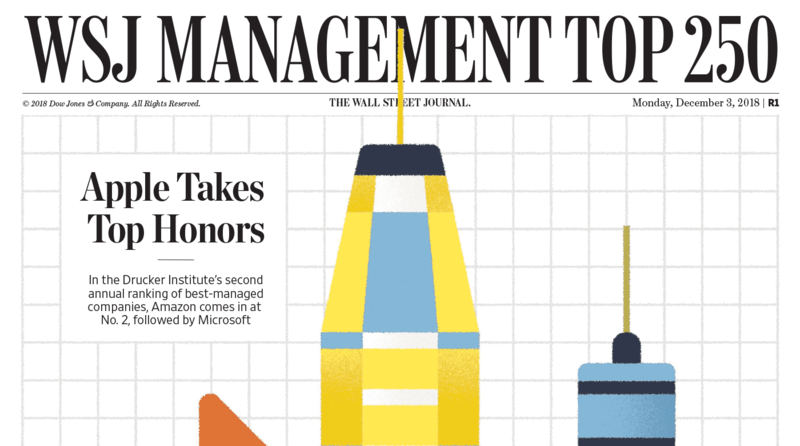 “Having our rankings featured in the Journal is an incredible honor,” says Rick Wartzman, director of the Drucker Institute’s KH Moon Center for a Functioning Society. “But it’s also started to have a great practical impact: It is prompting major companies to focus more on serving the interests of all of their stakeholders, not just their shareholders. “Altogether far too much in society—jobs, careers, communities—depends on the economic fortunes of large enterprises to subordinate them completely to the interests of any one group, including shareholders,” Drucker wrote. The number of leading data providers contributing to the Drucker Institute’s rankings model, including J.D. Power, Glassdoor, PayScale and Sustainalytics. “That meeting solidified our commitment to come up with a measure—based on Peter Drucker’s core teachings—that would look much more broadly at the way companies are managed,” he says. As another of the attendees put it, quantifying Drucker’s most essential principles was “a million-dollar idea”—that is, if anyone could figure out how to pull it off. He was extremely skeptical that anyone could. First, you’d have to distill the millions of words Peter Drucker had written about management down to a compact set of ideas. Then you’d have to figure out how to capture these ideas in measurable, numerical terms at an individual company level. And then you’d have to load all of that data into a model that would somehow allow you to make sense of the entire picture. The process got off to an auspicious start when Wartzman met with Lawrence Crosby, then the dean of the Peter F. Drucker and Masatoshi Ito Graduate School of Management. The two were catching up with one another, and it turned out that Crosby, too, had been toying with the idea of trying to quantify Peter Drucker’s principles. “We both looked at each other in astonishment that we were thinking along the same lines,” Crosby recalls. So began what became a four-year development project involving lots of trial and error, debate and discussion, calculation and recalculation. One of the first tasks was to distill Drucker’s 39 books and countless articles. “It was boiling the ocean,” says Wartzman. Eventually, the team homed in on 15 principles, spread across the five categories, that would underpin the rankings. The next task was to find the right data sources that would serve, in effect, as empirical proxies for the underlying principles. The team wound up settling on 37 sets of data from third-party sources. Finally, it was time for the biggest step of all: creating the statistical model itself. This work fell to Crosby, a PhD data scientist with deep industry experience. Major companies are starting to focus on the Drucker Institute’s corporate rankings in no small part because they’re being featured in The Wall Street Journal. The team’s hypothesis—based on Peter Drucker’s writings—was that each of the five key areas should be highly correlated, rising and falling together to a statistically significant degree. Although this might seem obvious to those who have a “stakeholder” orientation, few, if any, studies had approached the matter in a scientific way. Would social responsibility really correlate with innovation? Would financial strength show a statistical relationship with, say, employee engagement and development? Maybe the answer, in each case, would be no. By 2016, Crosby had gathered data on a few hundred companies and entered them into his computer model. It was now time to test the hypothesis. The test took place one night in Crosby’s home office in Telluride, Colo., at 11:59 p.m. “I finally pushed the button on my computer and held my breath,” Crosby remembers. What came back was better than he’d dared hope. The correlations between each of the five dimensions and the measure of total effectiveness ranged from 0.51 to 0.83, which are extraordinary figures in management science. For the first time, Peter Drucker’s worldview—that all of these different areas of corporate management are truly interrelated—had been borne out statistically. “I think I stood on top of the desk and cheered,” Crosby says. Also cheering have been those companies that have ranked highly enough to see their names grace the pages of The Wall Street Journal. Dozens of other corporations—including Alcoa, Procter & Gamble, Clorox, Sempra and Southwest Airlines—have likewise cited their inclusion in the Management Top 250 in reports or news releases. Some companies, meanwhile, have started to ask themselves how they can climb the list. Among these is Intuitive Surgical, which in 2017 had an overall effectiveness score near the middle of the pack. Executives there were happy to see that their performance was far above average in innovation and employee engagement and development, but they were surprised to be lagging when it came to social responsibility. “Our first reaction was, ‘Our scores are low! We are better than that!’” says Sal Brogna, Intuitive’s chief operating officer. Part of the job at hand, Brogna felt, was to make sure that existing strengths in social responsibility were being adequately reflected. “It became apparent that we had to be more transparent,” he says. For instance, the company could better highlight things like a commitment to certain standards in sourcing. The other part of the job was to set sharper long-term goals. Last summer, Intuitive reached out to Zach First, executive director of the Drucker Institute, for some help with this. First and Jones laid out how the rankings worked, where trends in corporate social responsibility seemed to be headed and which tradeoffs Intuitive might wish to consider. This point about tradeoffs proved especially relevant. While Intuitive is still keeping its social responsibility priorities confidential—out of caution in a competitive field—part of the process has involved recognizing that doing a few things thoroughly has more effect than doing many things partially. “There’s a limited amount of time, energy and resources to devote to anything,” says First. As First emphasizes, every company is different. Some stand out in innovation, others in customer satisfaction, and going for solid performance on some fronts usually makes better sense than trying to be exceptional on all of them. At the same time, being aware of all of these dimensions and thinking hard about them is often half the battle. Gather regularly with colleagues from across departments so that you can each gain the perspective of different stakeholders—a rarity in the corporate world, as it turns out, where three-quarters of functional C-suite leaders hardly, if ever, work together on projects or strategic initiatives, according to Deloitte. In addition to the principles underlying the rankings, check out Peter Drucker’s “Scorecard for Management,” another system for assessing how successfully capital has been invested; how effectively people have been hired and promoted; how innovation has been managed; and how well business planning has been carried out.